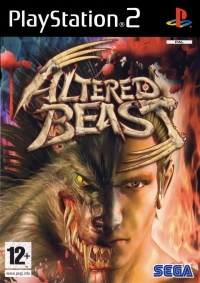 The story follows a man called Luke Custer who is a "Genome-Cyborg", which in the game is a human that has had his DNA and other genetic make-up altered so that he can (after acquiring the chip containing the right genes for each creature) transform into a mythical beast. The main creatures he transforms into are a Werewolf, a Merman, a Garuda, a Wendigo, a Fire Minotaur, and a Thunder Dragon. Its storyline differs from the original Altered Beast games where during the game, you gain a serum that allows you to change at will. 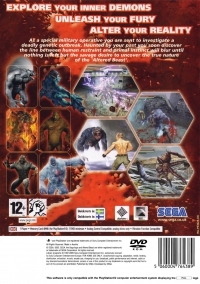 There are a number of difficult boss challenges and puzzles within the game, plus some extra characters to transform into including a White Tiger Man, a Grizzly Bear, and the alien-cloned U.W.H. (Unidentified Weightless Human) for those who finish the game. â€¢ and â€¢PlayStationâ€¢ are registered trademarks of Sony Computer Entertainment Inc.
All Rights Reserved. Made in Austria. or trademarks of SEGA Corporation. All rights reserved. to Sony Computer Entertainment Europe. FOR HOME USE ONLY. Unauthorised copying. adaptation. rental. lending. pan ot this product are prohibited. Published by SEGA. Developed by SEGA.